What`s Required to Confirm Booking ? Breakfast then at 8:00 am Pickup from your Hotel by our expert Tour guide to Start your full day visiting the Egyptian Museum of antiquities. On display is a rare collection of 5000 years of art the largest most precious collection of Egyptian art in the world. Over 250,000 genuine artifacts are presented, including an exhibit dedicated to the Tutankhamen collection of treasures, gold, and jewelry, as it was enclosed in his tomb for over 3,500 years before it was discovered in the 1920s when his tomb was excavated. Then visit the Great Pyramids - Cheops, Chephren & Mykerions. Cheops is the most colossal ever built. Next is a close-up look at Sphinx - a huge funeral complex guarded by the legendary lion body with the face of king Chephren. Then start your visit to Khan El Khalili Bazaars. Shops in this district are legendary for fine brassware, copper, perfumes, leather, silver, gold, antiques and more! Breakfast. Transfer to the domestic airport. Departure by plane to Aswan. Arrival, meet & assist by our local representatives and transfer to the Cruise. Boarding before lunch, Embarkation. Lunch on board. Visit the High Dam and the Philae temple. Sail to Kom Ombo. Afternoon Tea. Visit the temple shared by the two gods Sobek and Haroeris. Sail to Edfu. Dinner on board. Disco party. Overnight in Edfu. Breakfast on board. Cross to the West Bank to visit Valley of the Kings, the Temple of Hatshepsut and the Colossi of Memnon. The Excursion to the Valley of Kings; visit the tombs of various Dynasties, The Temple of Deir El Bahari. On the return journey stop at the Colossi of Memnon which are two gigantic sitting statues representing Amenophis III facing the Nile. And visit the Temple of Queen Hatshepsut.Lunch on board. Afternoon free at leisure. Afternoon Tea. 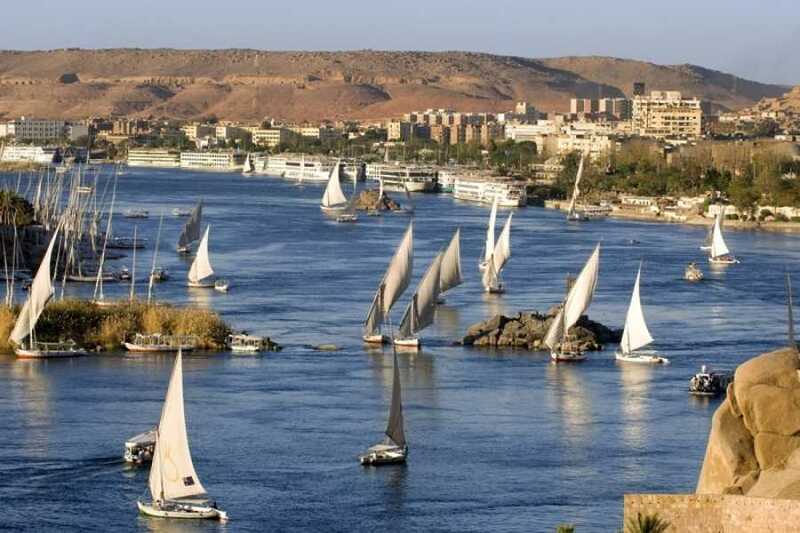 then Continue to the East Bank: Karnak and Luxor Temple: Excursion to the Luxor Temple to see its courtyard and the granite statues of Ramses the Great Proceed by carriage or bus to Karnak, which is a serious of temples, built in different reigns. Starting by the Avenue of Sphinxes visit the Unfinished Propylon, the Hypo style Hall with it's 134 gigantic columns, the Obelisks of Queen Hatshepsut and Tutomosis III, the temple of Amon adorned with lotus and papyrus designs, the Granite Scarbeus of Amenophis III and the Sacred Lake.Overnight in Luxor. Breakfast on board. Disembarkation. & At 6:00 am Transfer to the airport. Departure by plan to Cairo. Arrival, meet and assist by our representative and transfer from the airport to old cairo to Start your full day tour visiting Old Cairo that known as Christian Coptic Cairo which is Among the most important locations visited by the Holy Family where the spiritual impact of their presence is most felt still; though their stay was brief, for the Governor of what was then Fustat enraged by the tumbling down of idols at Jesus' approach sought to kill the Child. But they took shelter from his wrath in a cave above which, in later years, the Church of Abu Serga (St Sergious) was built. This, and the whole area of the Fort of Babylon, is a destination of pilgrimage not only for the Egyptians but for Christians from around the world. An air of piety and devotion pervades the whole district there. Also There you will be able to visit and Enter the Church of Abu-Sergah and St. Barbara, the hanging church, and the old jewish synagogue - Ben Ezra Synagogue. Then Continue your day tour to Islamic Cairo that was Founded in 641 A.D By the First Muslam leader Amr Ibn Elas Over there in Islamic Cairo you will be able to Visit and Enter the Following Mosques `Masjid` Amr Ibn Elas Mosque that was built in 642 A.D By the Muslim leader Amr Ibn Elas at El FUSTAT area then Followed by a visit to the Most and Biggest mosques in Cairo which is El Sultan Hassan Mosque that also known as `Madrasa El Sultan Hassan` that was founded by Sultan Hassan in 1356 A.D The Mosque-Madrassa of Sultan Hassan is a massive Mamluk era mosque and madrassa located near The Citadel in Cairo. Its construction began 757 AH/1356 CE with work ending three years later "without even a single day of idleness". At the time of construction the mosque was considered remarkable for its fantastic size and innovative architectural components. Commissioned by a sultan of a short and relatively unimpressive profile, al-Maqrizi noted that within the mosque were several "wonders of construction". The mosque was, for example, designed to include schools for all four of the Sunni schools of thought: Shafi'i, Maliki, Hanafi and Hanbali. Breakfast. Our representative will transfer you to the airport and assist you at the airport through final departure formalities. For any additional inquiries please don`t hesitate to Contact us . 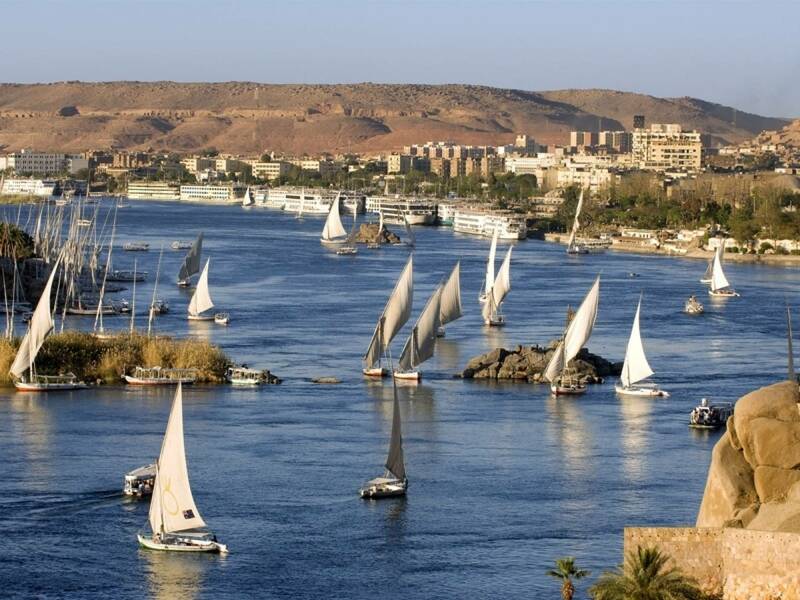 3 Nights on Cruise board; Aswan & Luxor full board (sight seeing included).